Liverpool-based students Sundogs bask in the approval of Getintothis’ Will Neville as they release a video and prepare to return to the boards in October. 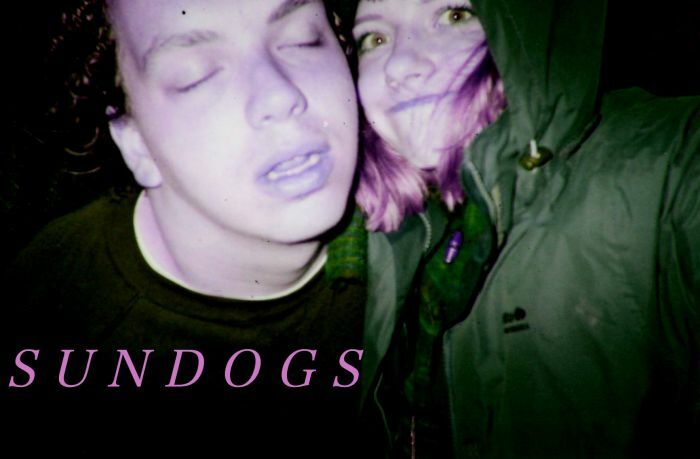 Sundogs are another in the long line of bands to emerge from the student scene in Liverpool. Brad sings, plays guitar, dominates the stage and writes most of the songs, with James Guile from garage grungesters Asterisks on guitar and falsetto backing vocals, who also contributes to the writing, with the pair also bringing the most hair to the band. The other two members of the band are bouncing Norwegian bassist Audun Laading and Stephen Fitzpatrick from Barrow-in-Furness on drums, who also operate as a dreampop duo called Her’s. They were last seen on a bill with When I Am King and Taws amongst others at The Shipping Forecast back in May, and sit alongside these and other bands like The Sneaky Nixons as the latest scuzzy slackers on the scouse block. Their proclaimed influences include Pixies, Jonathan Richman, Pavement and Burt Bacharach, as well as “romance, ciggies, cheap alcohol, feminism, and right weird videos on YouTube”. The grunge influence is hinted at when Brad wears a t-shirt in homage to the very late Sounds music weekly, just as the nearly-as-late Kurt Cobain once did. There’s a couple of tunes already on their SoundCloud, but more recording is planned for September. The groovy To Be My Girl features aloof, somewhat lugubrious spoken vocals in the best Lou Reed/Ian Dury tradition, backed by some lovely wah-ing and chiming guitar. You can see the video for this track below. There are also hints of surf pop and garage rock in their music, with the baritone vocals a stand-out feature on their other tunes as well, and hints of Felt’s Lawrence on Shangri-La. To Be My Girl is certainly a step up from most of their previous songs to these ears, which bodes well for the future as they continue to develop. If you like the sound of Sundogs, then you can next catch them at The Magnet on October 16.